H. Skipton Leonard is a Faculty Member in the Carey Business School at Johns Hopkins University, USA, and lectures in organizational assessment and communications at George Washington University, USA. The author of numerous books, chapters and articles, he is executive director of the non-profit World Institute for Action Learning, devoted to leadership and organizational development worldwide. Arthur M. Freedman is Adjunct Professor in the MBA/OD program at the Carey Business School, Johns Hopkins University, USA. A licensed consulting organizational psychologist, he is co-founder of the World Institute of Action Learning and has been consulted by organizations globally. 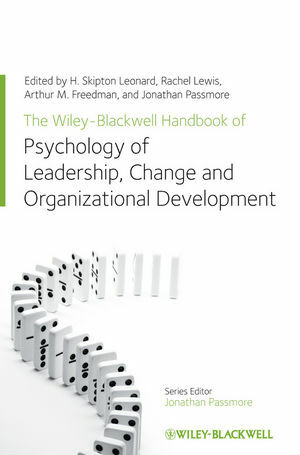 His books and articles include the co-authored Action Learning for Developing Leaders and Organizations (2009). Rachel Lewis is Senior Lecturer in Business and Occupational Psychology at Kingston University, UK, where she is also director of the Affinity Health at Work consultancy. She is the co-author of Preventing Stress in Organizations: How to Develop Positive Managers (Wiley-Blackwell, 2011), as well as numerous peer-reviewed articles. She specializes in leadership, management, and employee well-being. Jonathan Passmore is one of the UK’s foremost leadership coaches with a wealth of private sector and academic experience. His prolific research, writing, consultancy, and worldwide speaking engagements have made him a recognized authority on coaching and organizational change. His many books and articles include the best-selling text Excellence in Coaching (2006).